Your ear pads may wear out or become stained, damaged – who knows, maybe you loaned them to someone with cooties – long before your headphones go bad. Replace 'em as needed. 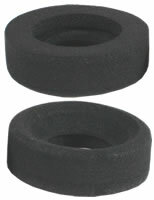 Replacement ear pads for the Grado SR225i, SR325i, RS2i, and RS1i headphones.